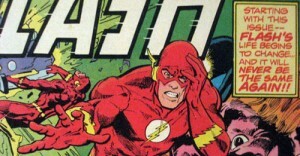 Welcome to the first installment in our analysis of the soon-to-be-reprinted “Trial of the Flash”, and related Flash storylines! Arguably the most praised and vilified pre-Crisis Flash tale, the Trial story was written by Cary Bates, began in 1983 and ran through the title’s cancellation in 1985. 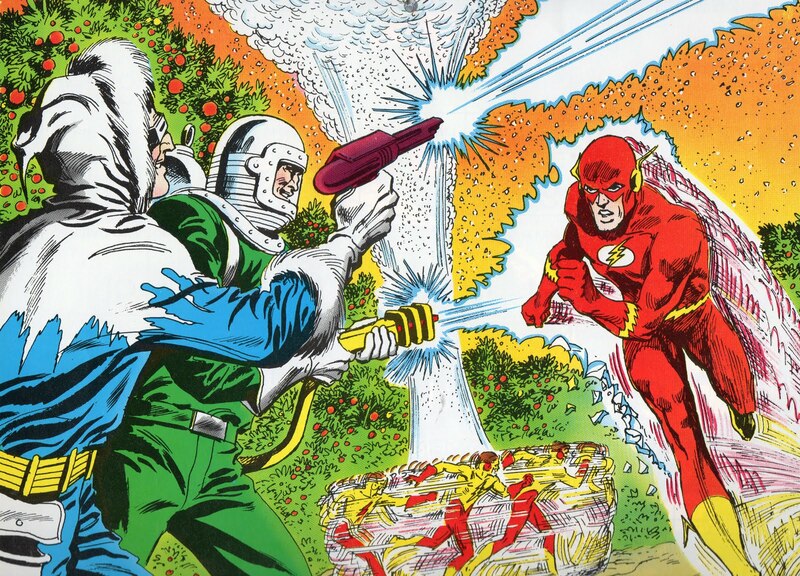 With seeds in stories from as far back as 1979, the Trial was essentially the collision of years of Flash plot threads. These stories are some of the earliest examples of long-form, soap-opera style writing in DC Comics. 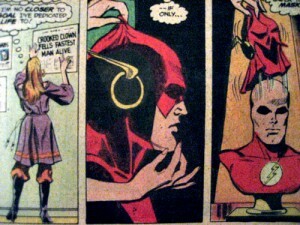 In 1979, following the departure of longtime editor and DC luminary Julius Schwartz, the tone of Flash took a dark turn. 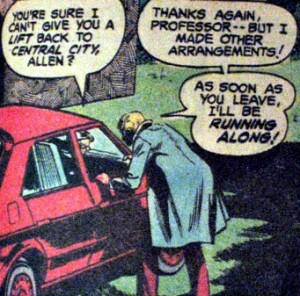 Barry Allen’s duties as Flash and police scientist began to clash with his wife Iris’ desire for a more stable relationship. Stories at the time, both in Flash and Adventure Comics, often featured this tension. Showcase Presents: Trial of the Flash will reprint issues #323-327, 329-336 and 340-350. We will look first at issues that laid the groundwork, leading up to the collection’s July 20 release date, and then at the contents of the collection. Feel free to submit your own notes, comments, memories and/or corrections. Enjoy! COVER: Rich Buckler sums up some of the key moments in this issue. The caption is not kidding around. It’s actually a rare example of honesty. PG. 1 – 5: The whole opening sequence with the Clown feels off. The captions prepare you for it, but it still comes across as a stretch. 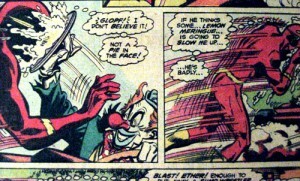 Flash rarely struggled in those days, and has to be moving pretty slowly when he gets pie’d in the face. I assume this guy was explicitly cast, at least at first, as a stock villain. More “a clown” than “The Clown”. PG 6: The shot of Flash knocked-out is effectively embarrasing. This was definitive artist Irv Novick’s last issue, and he is in top form. His earliest issues are some of the best of the best when it comes to this era of Flash. The heroin plot is not typical Flash-fare. I originally expected it to be alien invasion, but with drugs. PG. 7: Barry sure makes a lot of unnecessary references to running in order to explain his lateness. The officer implies a dog ate all of the Clown’s ether-pie, and we learn a little about Barry’s educational background, all part of the fleshing out that seemed to be the new mandate. The Nephron Process is the third plot thread of the issue, already somewhat heavier stuff for Flash. The Process owes a lot to A Clockwork Orange, and basically involves sending positive and negative reinforcement directly into the brain via some sinister-looking machinery. The kicker: its inspiration comes from a college dissertation written by…Barry Allen. PG. 8: Captain Paulson gives Barry a “Get Into Jail Free!” card, and brings the term “blown away” into the mainstream, all in one panel. Iris’ anger introduces the fourth plot thread, and Barry’s inability to “Flash” his way out of a personal problem is another wholesale change. PG. 9: We’re introduced to Flash’s female stalker, a stand-in for the fan, literally looking to learn more about the man behind the mask. PG 10 – 12: Even the weather, and memory, are not on Barry’s side. Barry’s dissertation must have been strong stuff. Prof. Gilbert Nephron (on first-name basis with Barry here) has taken it to a zealous extreme, and the warden is already committed to using human guinea pigs to test it out. Their entire discussion has been broadcast to the prisoners, and their reactions are priceless (“Ain’t nobody messin’ with my pleasure center!”). Barry’s not too into the idea, which has to be tough given his unwitting role in its genesis. We’re also introduced to Clive Yorkin, a key player in the next few issues. PG. 13: Barry really loves almost telling people he’s Flash. The crooks are right, and hiding heroin in the crime lab inspired me to get a t-shirt with my social security number on it. PG. 15-17: I believe the Clown is supposed to seem beneath the Flash, and Flash’s inability to deal with relatively routine threats are a symptom of a bigger problem. The bomb alone is a pretty straightforward challenge, but a mental mistake ends in Flash merged with a wall (first time?) and at the mercy of a sinister calliope. NEXT ISSUE: Flash is tired of “clowning” around, but Iris is more tired of it! This entry was posted in Annotations, Flash History and tagged Bronze Age, Death of Iris Allen, Trial of the Flash on March 24, 2011 by Greg Elias.